Staying hydrated is important for maintaining your health. As a matter of fact, the human body is made up of over 70% water; many of us still do not drink a sufficient amount of water daily. There are few things in the world more refreshing than an ice cold glass of water. Maybe it’s the lack of flavor that makes us deny ourselves an essential natural resource, while inadvertently damaging our bodies. Most of the time we are simply not drinking enough water, however excessive sweating, blood loss, diarrhea, and fever are some conditions that lead to dehydration. 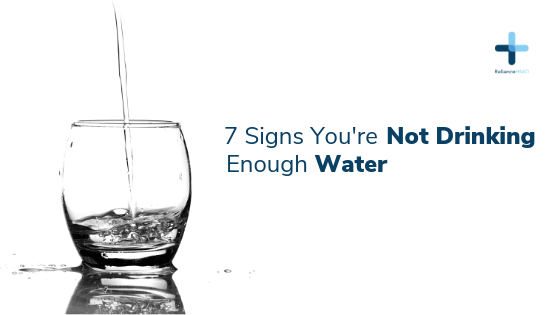 Here are seven signs from your body that let you know when you need more water daily. Dry Skin – This is an early sign of dehydration, which might be a precursor for a severe health issue. Not drinking enough means little or no sweating; this causes the body to retain toxins and salt normally excreted through the skin. It also affects the skin’s ability to shed dirt and accumulated oil; drink more water to stave off acne breakouts. Dry Mouth – Water lubricates the mucous membranes in the throat and mouth; it keeps your mouth moist long after taking a drink. Headaches – At times this might be a way of the body informing you it needs more water. Since the brain is a top priority in the body, water from the blood is used by the brain. This eventually affects oxygen intake for the brain and leads to a headache. Loss of Muscle Mass – Fitness experts always advise drinking water before, during and after a workout. Muscles are made up mainly of water; this means the less water in the body, the less muscle mass. Digestive Problems – Dehydration causes the strength and amount of mucus in the stomach to reduce, this may lead to the accumulation of stomach acid. This eventually leads to indigestion and heartburn. Fatigue – Feeling disoriented and tired when you are dehydrated are warnings. When fatigue sets in, we just reach out for another energy drink or coffee to get an energy boost. When really a glass of water is the best choice; coffee and energy drinks will long term lead to further dehydration. Dry Eyes – Your level of hydration affects more than your mouth. Without water in the body, your tear ducts dry up, some blood-shots formed in the eyes are a result of dehydration.